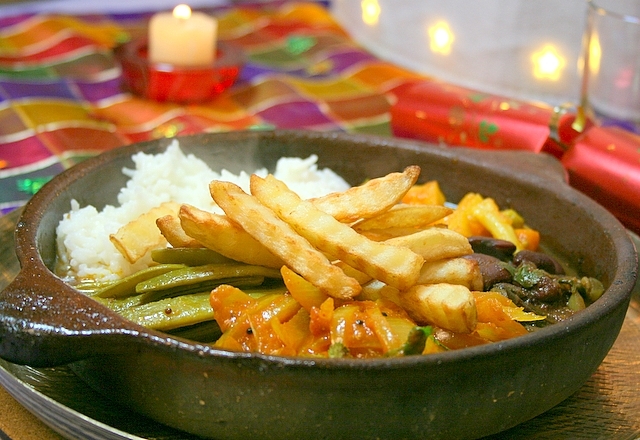 There are many different varieties of vegetarian sizzler, it can be done with boiled vegetables, or using themes like making a Chinese version. It does not always have to be just curries, you can also add some cutlets and salad to the curries as well. Don’t be put off making this dish because it contains four different curries. The curries themselves do not take too long to make and if you organise yourself and utilise all the hobs on your cooker, you’ll be able to manage it without any problems. 1) Wash and soak the rice in cold water for a while, boil the hot water for cooking. Also pre-heat the oven for the chips to be cooked. 2) Cook the rice in boiling water with salt and cumin seeds, for about 10 minutes or until done. Once cooked drain the excess water and keep aside until ready to be used. 3) Cook the chips in the pre-heated oven until golden brown, and keep aside until ready to be used. 1) Pre-heat the plates on stove tops and add the oil, and the individual portions of each of the curries and rice and top with the chips in the middle. Be careful as you do this, because the heat is quite intense and the liquid from the curries will splatter a little. Once it starts to sizzle switch the stove off and take to the table placing on steel plates or on heat proof mats, enjoy 🙂 . Kiran ~ Yes there are many different types of sizzlers you can create and also make them in many different world cuisines. So you can add noodles.